A distracted lorry driver ploughed into the back of a car, crushing it and killing two passengers instantly – then shocked rescuers when he declared ‘this is all I need, this is my first day back from holiday’. Shockingly, Rogers, 65, didn’t even apply the brakes of his lorry until three seconds after he had slammed into the back of the Audi with pensioners Michael James and Susan Curtis inside. 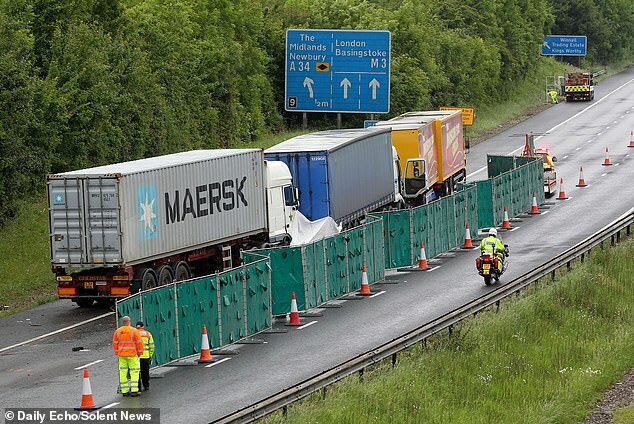 Friends Mr James, 77, and Ms Curtis, 67, who were returning from a weekend away together, suffered horrific fatal injuries as their 4×4 was obliterated when it was sandwiched between Rogers’ HGV and another lorry. Rogers was today jailed after a judge heard the driver told rescuers ‘this is all I need, this is my first day back from holiday’ after failing to spot slow moving traffic from 200 metres away. 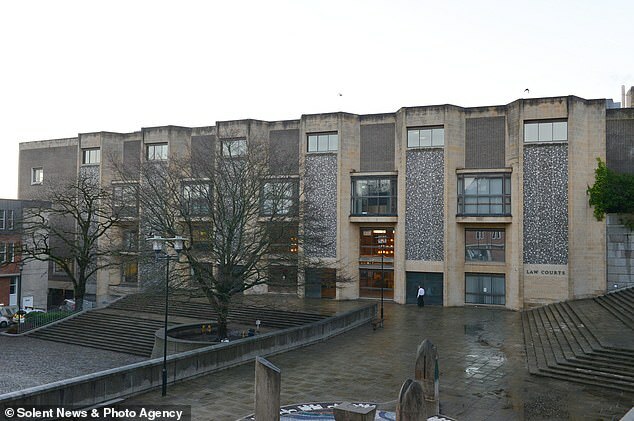 Winchester Crown Court heard Rogers’ DAF XF was travelling at 52mph on cruise control when he hit the car at 10.20am on the M3 motorway by Winchester, Hampshire. Rogers tried to blame Mr James, who was in busy traffic and doing just 11mph, for the horrific collision, claiming he had pulled in front of him and even told police he was an ‘idiot’. Judge Susan Evans told Rogers losing attention for nine seconds created a ‘substantial risk’ to other motorists as she jailed him for four years and eight months. In one video, a passing lorry reveals how little there was left of the Audi as it was concertinaed between the Renault lorry in front of Mr James’ car and Rogers’ DAF XF. 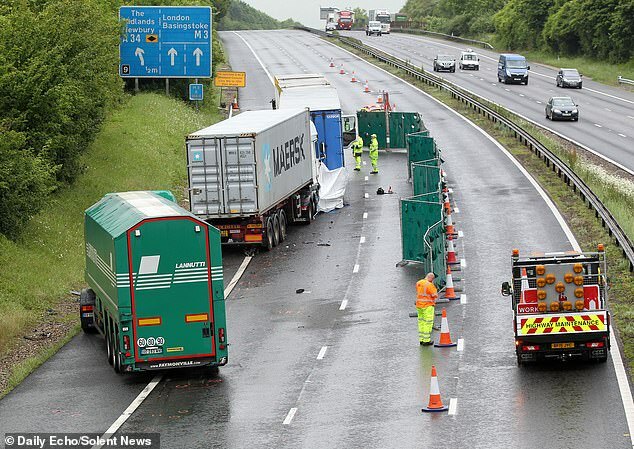 Footage from the Renault lorry Mr James’ car was crushed into shows it then being smashed into the rear of an ERF lorry. The driver of the Renault lorry is heard screaming in pain. Mr Wright said despite emergency services rushing to the scene, Mr James, of Broadstone, Dorset, and Ms Curtis, of Aylesbury, Buckinghamshire, were pronounced dead at the scene on June 5 last year. The prosecutor said: ‘There were signs warning about the traffic, one of those being a kilometre back from the slow traffic. ‘The defendant was travelling at a consistent speed of 52mph, while the Audi had been doing about 11mph. ‘When other motorists went to help the defendant in his cab, he said ‘this is all I need, this is my first day back from holiday’. ‘He claimed the Audi had pulled in front of him and he could not avoid the collision. ‘From this, you can infer he was calling Mr James an idiot. ‘We are still unable to say what caused the defendant’s inattention. ‘Shortly before, Mr Rogers had pulled out of lane one, into the middle lane, in front of Mr James. The Audi had to break and then the defendant pulled back into lane one. Jailing him and banning him from driving for four years, Judge Evans said: ‘On June 5, 2017, a tragic collision occurred on the northbound carriageway of the M3 motorway. ‘It was caused by dangerous driving and led to the death of two people, Michael James, a much loved father and friend, and Susan Curtis, a much loved mother and friend. ‘To say their families have been devastated by this does not do it justice. They have had no chance to say goodbye to a loved one. ‘There’s nothing this court can do to compensate the loss of their lives. ‘Your attention was in some way distracted for a period of nine seconds, it is not known what caused you to be distracted. ‘You did not, in fact, brake until three seconds after the collision. It seems to me this created a substantial risk of danger – you did not seem to respond to the traffic. Mitigating, Alexander Greenwood told the court Rogers ‘was not tired’ and said the crash had a major impact on his client, who had been an HGV driver for 18 years. He said: ‘Nothing I can say, in any way, can begin to mitigate for the terrible loss of the two families. ‘Mr Rogers had a latent heart condition, there’s no question of him not being able to drive as he had been medically cleared, but it is right to observe that. ‘He is simply unaware of how this collision occurred. Speaking after the sentencing, crash investigator PC Mark Furse said: ‘Rogers had at least eight to nine seconds to stop his vehicle and could have done so safely in half that. ‘He did not apply any braking until around three seconds after the first impact. ‘This absolute tragedy just shows what a few moments of inattention can result in. The need to pay full attention at all times in paramount.